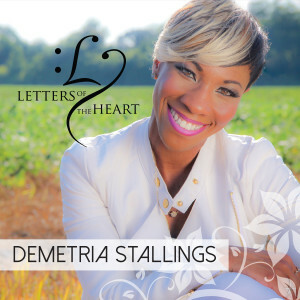 Demetria Stallings debut EP, 'Letters Of The Heart', was released on Valentine's Day Weekend 2016, and became available on February 12, 2016. 'Letters of The Heart', was produced by GRAMMY Nominated producer Mark Carman and was released by Mansion Entertainment through Sony RED. The album includes several songs that showcase Demetria's heart and talent for songwriting and has also become part of the catalyst for the #LOTH movement with the purpose of changing hearts through love. Christian Music fans will recognize the music and face of Demetria from her many Christian Television performances on programs such as TBN's Praise The Lord and TBN's Best of 2015 as well as being regularly featured on several CBN programs, including the popular 700 Club.